Pasta Alfredo is a traditional pasta dish, which sauce is based out of cream, butter and parmesan cheese. Not very plant-based or vegan at all. It’s a really nice dish though, and something that you quickly can make on a weekday evening. 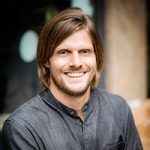 So how do we veganize this? 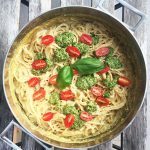 To make this vegan pasta alfredo recipe you need cashew nuts as they give the sauce the thick creamy texture. To get the cheesy flavour I always resort to the trustworthy nutritional yeast, and this time is no exception. I had a couple of tries of this before I felt that I had the right ratio of everything. But now, as I have perfected (well that didn’t sound very humble) it I want to share it with you. To make this recipe you can use whichever pasta you like. The most common ones that are used are fettuccine or spaghetti. I went for spaghetti because it was the sort of pasta I had at home. The first thing you need to do is to bring a large pot of water to a boil and cook the pasta according to the manufacturer. Next up, you need to grind the cashew nuts in a food processor until you have a fine powder. It takes a little time, but keep an eye on the processor while you grind because if you grind for too long, you will end up with cashew butter. Once you are finished, transfer the ground cashews to a small bowl and put aside. Take a knife and mince the onion and garlic roughly and fry them in a frying pan together with a little oil until the onion starts to brown. Remove from heat and put the onion and garlic in the same bowl as the ground cashews. 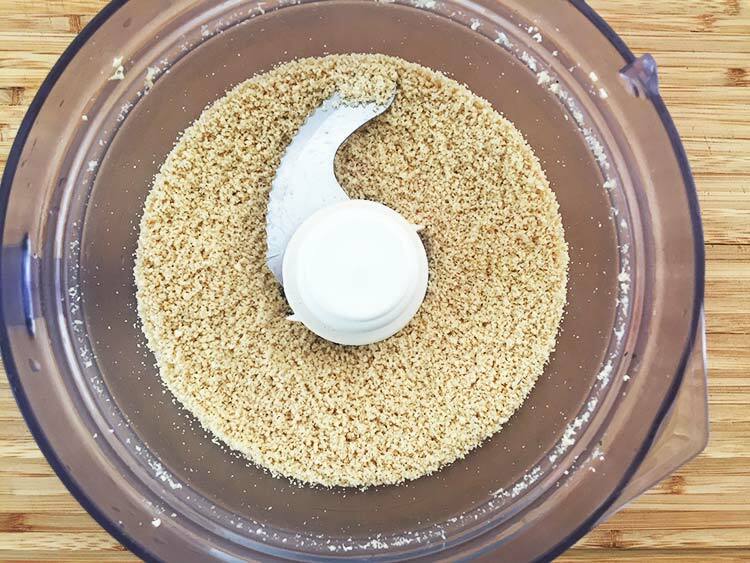 Add the soy milk, cornstarch, onion powder, garlic powder and nutritional yeast to a food processor and process until smooth. This spice combination really brings out the nutty, cheesy flavour in the alfredo sauce. Add the grounded cashew nuts, onion and garlic together with salt and pepper and pulse until everything is combined evenly. Pour the sauce into the same frying pan you fried the onion and garlic in and bring to a simmer over low heat. Let the sauce thicken up a bit and then add the pasta. Make sure you coat all the pasta with the sauce. Top everything off with some cherry tomatoes cut in half, a couple of dollops of pesto (make your own basil and kale pesto) and serve immediately. That’s it! If you try this recipe out let me know what you think of it in the comments below. As always you find more recipes and other things I post on Facebook, Instagram, Pinterest and Twitter. A vegan version of the classic pasta alfredo. Perfect comfort food for weekends or easy weekday dinners. Bring a large pot of water to a boil and cook the pasta according to the manufacturer. Mince the onion and garlic roughly and fry with the olive oil in a frying pan with high edges until the onion starts to get brown. Remove from heat and put aside. Mix the cashew nuts in a food processor until they have become like a fine powder. Transfer to the same bowl as the onion and garlic. Add the soy milk, cornstarch, onion powder, garlic powder and nutritional yeast to the food processor and mix. Add the onion, garlic and cashew nuts and pulse until everything is combined. In the same frying pan as you used for the onion, pour in the sauce and bring to a simmer over low heat. Once the sauce starts to thicken, add the pasta. Make sure to cover all pasta with sauce. 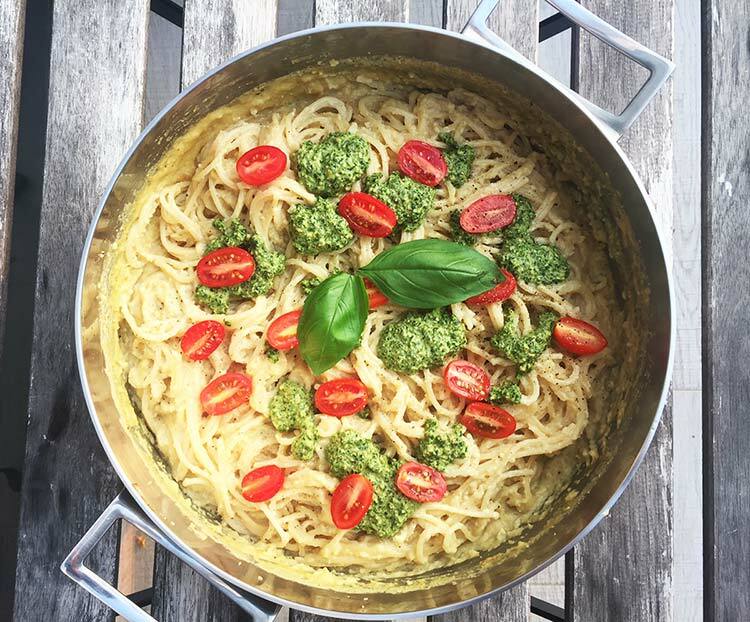 Cut the cherry tomatoes in half and top the pasta together with the pesto. Serve immediately.